Star Trek: Deep Space Nine was the third incarnation in the franchise when it premiered in 1993, running concurrently with The Next Generation until 1994, followed by Voyager until concluding in 1999. It was also the first Trek series created without the direct involvement of franchise creator Gene Roddenberry, who reportedly opposed the show’s darker tone. Arguably the franchise’s boldest venture, Deep Space Nine sets itself apart by shifting focus from episodic-style deep space exploration to serialized character-driven plots involving religion, relationships, politics, and war. The show’s setting on a stationary object – as opposed to a traveling starship – is largely credited for this shift. DS9’s strong reliance on characters yields to the franchise’s most diverse cast of characters, including a large ensemble of recurring characters. As previously mentioned, the series primarily takes place on station Deep Space Nine (DS9), a Cardassian-turned-Federation outpost at the crossroads of space. The series begins shortly after the Cardassian withdrawal from Bajor after 40 years of repressive occupation. Desperate, fearful, and on the brink of civil war, the fractured Bajoran Provisional Government requests assistance from the Federation, who re-occupy the former Cardassian station orbit Bajor. Previously known as Terrok Nor, the station was built by Bajoran slave labor as an ore processing facility and command station during the occupation. Originally intended to be a rudimentary, short-term assignment aiding the Bajorans as they rebuild from the occupation, Starfleet’s purpose suddenly escalates upon the discovery of the first stable wormhole – a direct doorway to the distant Gamma Quadrant. With the infinite possibilities of an instant doorway to the other side of the galaxy, Deep Space Nine suddenly becomes one of the most important outposts in the galaxy. Hopes of peaceful exploration are abruptly quelled, however, when the frequent incursions threaten the Gamma Quadrant’s long-reigning power… The Dominion. Lead by The Founders and their faithfully devoted servants – the Jem’Hadar and Vorta – The Dominion controls a vast portion of the Gamma Quadrant. Perceiving the Federation as threat and hoping to capitalize on the wormhole’s potential to expand their territory, The Dominion beginning supplementing the Cardassions as the show’s primary nemesis beginning in the third season. The deeply spiritual Bajorans are guided by gods they refer to as The Prophets, who are actually advanced non-linear beings living in the wormhole. When Sisko – an outsider – is chosen to be the Prophet’s Emissary, much to his own displeasure, he faces antagonism from Bajor’s ambitious spiritual leader… Winn Adami. In the end, Sisko’s linkage to the Prophets is proven to be resolute. 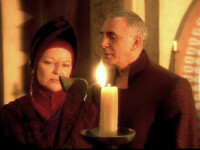 The Founders, who are revered as gods to the Vorta and Jem’Hadar, also contribute to DS9’s strong spiritual backdrop. With both the Bajoran government and religious leaders in a constant state of flux, politics play an important role in the series. Other species’ politics are also examined deeply, particularly those of the Klingons and Cardassians. While the series is often regarded as the darkest in the franchise, it also contains enormous comic relief. With a handful of whimsical Ferengi living aboard the station, most of the humor is derived from situations involving Ferengi characters. Debuting in the second season finale, the Dominion supplement the Cardassian as DS9’s chief villain. Already controlling a vast portion of the Gamma Quadrant, The Dominion perceive the Federation as grave threat and hope to capitalize on the wormhole’s potential to expand their territory.